When arriving in Spain I immediatley felt well and a little bit like at home. Despite that, there are of course differences in habit and the daily life. One of those diffences is the attitude how to handle plastic. Every shop and supermarket is packing your stuff into bags. Even it is already packed into plastic, the product is wrapped again in plastic. The huge amount of waste is uncredible. And it is absolutely normal to do it in that way, at least for me it seems like it is normal. Compared to that, in Germany everyone is forced to avoid to use that amount of plastic in your daily life. The plastic bags in the supermarket are quite expensive, around 25 ct per bag. Therefor, a lot of people bring their own baskets and bags for the shopping. The annual consumption in 2010 were estimated with 198 bags per citizen. Spain was below average with 120 bags, Germany consumed only 64 bags and the „leader“ were the eastern european countries as Latvia, Lithuania and Estonia (466 bags). Denmark, Sweden and Ireland only 4 to 18 bags per citizen. How can you manage to consume only 4 BAGS per year??? 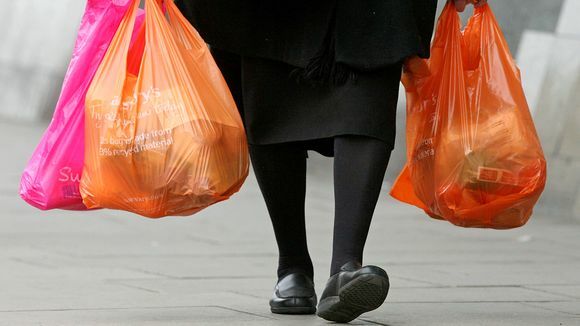 In the European Parlament the representives of 28 member states agreed with the proposal „Reducing Plasticbag Consumption for the Environment”. The pharmaceutical sector is a sector that needs a very strict control in the supply chain and logistics controlled temperature, because there are very important products for the health of people and it’s sold in pharmacies and used in hospitals. On Monday January 5, 2015 the existence of new solutions for pharmaceutical logistics was published on the website “www.cadenadesuministros.es”. This article says that Liebherr has launched new products aimed at improving the daily work in warehouses and transport in the pharmaceutical sector. Also, Frigicoll will become the supplier os the solutions in Spain. The advances in new technologies are helpful for this sector. Creating a device (RS485 interface) to manage incidents even without being in the laboratory and the possibility of receiving alarm messages to a mobile device about these issues. Moreover, the experience of Frigicoll in refrigeration, has served to launch a line of logistics necessary for pharmaceuticals products. With this, they can distribute equipment for chemical storage, which is an improvement for laboratories, warehouses, hospitals and pharmacies, and even for transportation. The fist image that comes to my mind when I hear about the word “logistics” is a container port. This can be due to the fact that I live in Valencia, where we can find the sixth container port in Europe with the major containers movement. I’m used to seeing from my early years, not too far from the beach, enormous cranes near to huge surface area full of containers, and also a lot of lorries carrying containers in and out of the city. Direct: communication between boat and ground transportation is almost immediate because in the moment that a boat arrives to the port, there is a lorry or a railway waiting to pick the freight. Boats are discharged with pier’s cranes, which are very big gantry cranes. Semi-direct: operation in which the communication between seaway and overland requires a gathering esplanade in the port. So the containers have to stay in the esplanade until the land transport (rail or road transport) arrives. Indirect: in this operation it is needed not only a gathering esplanade but also the freight is stored during a period of time. The containers are moved from the discharge zone to the storage area by straddle-carrier. Therefore, the staff has to manage the huge amount of lorries that are waiting to be loaded from a boat that has just arrived to the port, but also from the containers that have been stored some hours, days or months before. Loading and unloading ships subsystem, which is in charge of resolving the maritime interface and all the aspect of civil engineering, the necessary equipment such as the forklift trucks and all the agents involved in this activity. The container storage subsystem occupies the largest part of the terminal surface. A suitable layout is very important because it is strongly attached with the land transport, and also is very significant the type of handing mechanism. Reception and delivery ground transport subsystem, which is composed of all the volume information, facilities and the specific area in order of making easier the door to rail and road transport. Internal interconnection subsystem, which is essential to guarantee horizontally containers transport among the other three subsystems. In addition to these, we should emphasize the complexity of operating with heavy loads and manipulating the specific machinery. Also, they have to manage the empty containers and coordinate the ones which have to stay in the warehouse taking into account when is the departure schedule. And we are missing to talk about many other factors that also demand operations of planning and control because there are not only Full Container Loads (FCL) but also what is known as Less Than Container Load (LCL) which requires an additional subsystem to load a container with a variety of ways of present the freight such as boxes or pallets. LCL is the freight traffic that is set together for being transported but it has to be separated in destiny. As we have seen, the container terminal could be considered as a paradigmatic case of complete and complex logistic activity. 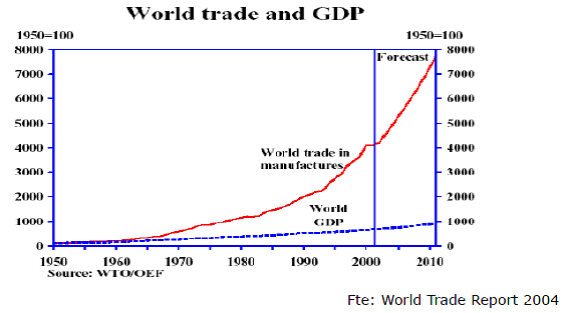 In the last class of Logistics, we were talking about the tremendous growth experienced by international trade relative to GDP growth from 1950 to the present. This means that although the level of production of goods and services has grown, proportionally the number of transactions has increased more. Generally, a larger number of transactions represent more movement of raw materials, goods, merchandise or products. That is, more transport. We saw reflected this fact in the following graph but there is more updated information in this web. Let’s see an example of what we mean. Take an important spanish guitar factory and call it XGuitars (we could find some real examples like this). Well, to just over 20 years ago, XGuitars bought directly raw materials to build their guitars, then processed these raw materials in the most appropriate manner, and finally guitars were built and sold. But this simple model has been complicated. There are specialized companies in Spain importing all kinds of woods (the same guitar may contain parts made with American, Asian, African and European woods). They get better prices than XGuitars. So to XGuitars it is more profitable to buy their raw materials to these specialized importers. XGuitars processes the wood to get parts that form the guitar. The assembly of the guitars is a very manual process and labor is expensive, then the prices of the most basic models are expensive and competitiveness is lost. So, cheaper hand labor is sought, but where? Well, usually in China (although this is changing). Improvements in sea transport and its price make profitable for XGuitars sending parts or mounting kits to China. There, the guitars are assembled and returned to Spain. Guitars are received and finished and after passing an exhaustive quality control, are released. And for several years, the market is basically the international market and especially the Chinese! To summarize and simplify, the woods importer buys raw material in many different parts of the world (first transaction), XGuitars purchases it to the importer (second transaction), XGuitars sends the parts to China (third transaction), China returns the assembled guitars to XGuitars (fourth transaction) and finally, XGuitars finishes the guitars and sells them to China (fifth transaction). Is it a complex model or not? Fresh Roses in Time For Valentine’s Day! Valentine’s Day! The most romantic day of the year for many many couples and friends, celebrating Valentine’s Day is a must in the U.S and one of the two days in the year where thousends of flowers are bought, besides Mother’s Day. Eighty porcent of the flowers sold in the U.S for Valentine’s Day are shipped from Latin America, where fabulous weather conditions allow countries such as Colombia, Ecuador, Guatemala & Costa Rica export only for Valentine´s Day the incredible amount of 231,466 flowers. Shippings starts weeks before the 14th of february, these beauties journey to the U.S. takes two-weeks, just in time to be blooming at their best in this lovely holiday, but how this is possible? , surprising, right? because for most of the women if a roses bouquet last at least more than ten days looking beautiful, is like winning a big battle! But the travel flowers have their secrets….. shipping & temperature conditions make it all! Let’s look the flowers journey! Day 8-10: Distribution to Independent Retailers… Still refrigerated at the right temperature! Day 9-11: Distribution to Stores … Flowers are distributed to stores ready to Shine! Flowers make a big journey from Latin America , in every part of the process there is a risk that if flowers are exposed to warmer temperatures and in those cases they bloom earlier causing loss to the companies, the exceptional logistics is in keeping the costs and temperature so lucky valentines can receive their favorites flowers fresh with many days of life to come… And to find a balance between not receive them too early… or too late in the stores. So next Valentine’s Day you will know the hard work behind the romantic gesture of the flowers you received or that you bought..! Since some years ago, It has become very usual to buy items from other countries by internet, using pages as Ebay or Amazon. The confort of buying from your own computer and the posibility to search for atractive prices (for example in China’s goods) has made increase the international packets trafic, specially in Christmas. In the attatched new link, we can see a situation happened by no taking this into account. -Warehouse capacity: seems to be very limitated for the actual needs. -Wrong planing: as said before, the increment of packets produced by Christmas season was not taking into account. Extra temporarly staff would have helped to processing more packets in less time and reduce the extra saturation effect of Christmas. This is a good example about a logistic problem. It would be interesting also to know the later process of the packets, how they are picked from the tons we can see in the image, processed and delivered, because in related news I saw comments saying that packets are not always delivered in order: it seems some packets were waiting for being picked there for a month, while others arrived later were processed and delivered in just one week.